The Therma-Stor HI E Dry Vehere Dehumidifier is the third and final model offered in the HI-E Dry range of commercial and indoor pool dehumidifiers. Its FOCUS™ technology makes it up to 200% more energy efficient than conventional refrigerant dehumidifiers and enables this unit to remove 185 pints (AHAM) of moisture per day while drawing only 12amps from a standard 115v circuit. With flexible installation options to allow the optimum location for positioning the unit this dehumidifier is well suited for applications in high humidity public areas such as spas hot-tub and hydrotherapy areas in addition to indoor pools. The HI E Dry Vehere Dehumidifier is designed for use as a pool dehumidifier and for other applications in high humidity commercial and industrial facilities. This dehumidifier features flexible installation options in order to suit a variety of user requirements and site characteristics. The Vehere may plugged in to an available power source and is configured for operation from a standard 115v/15amp outlet for use almost anywhere. If a stand-alone installation is inconvenient or undesirable an optional ducting kit is available which includes a 12-inch flanged duct collar for the intake opening and a tabbed duct collar for the exhaust outlet. Either intake or exhaust openings, or both, may be ducted enabling the dehumidifier to be used to operate across a number of smaller, partitioned areas or to be located out of sight of a public area being dehumidified. Air filtration is provided by two pleated media MERV-11 air filters for improved air quality. The filters are washable and may be replaced as required, usually once per year. 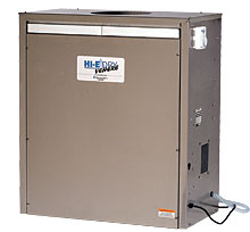 The HI E Dry Vehere Dehumidifier is capable of operating throughout a wide temperature range. It has an effective auto-defrost system for low temperature operation and will be effective at temperatures as low as 33°F. It also excels in the higher temperatures which it is most likely to encounter as a pool dehumidifier and will continue to perform reliably and effectively up to 110°F. The unit will be equally effective in other, related applications, spas and hydro-therapy facilities for example. Indeed, any application in which an efficient, high capacity dehumidifier is required to deal with high humidity conditions will find the Vehere equal to the task. The HI E Dry Vehere Dehumidifier is a very powerful unit with the ability to remove 185 pints of moisture from the air per day. Water extraction rates will, of course, vary according to temperature and relative humidity and the figure of 185 pints will be achieved at 80°F and 60% relative humidity. At saturation, for example, the water extraction rate doubles, to 370 pints, while at 60°F and 80%RH it falls to 160 pints. Within the range of conditions which are found at an indoor pool it will be apparent that this unit will extract massive amounts of moisture at all times. Despite its large capacity the HI E Dry Vehere is a highly energy efficient unit. Therma-Stor's FOCUS™ technology is the key to this efficiency and pre-cools intake air using cooled, dehumidified air in order that more moisture can be extracted from the intake air as it passes over the coils. This process does not use additional energy and enables Therma-Stor to claim that the Vehere is up to 200% more efficient, and removes two to three times more water per kilowatt-hour of electricity, than standard dehumidifiers. An adjustable humidistat is incorporated with the HI E Dry Vehere Dehumidifier which automates humidity control and saves further energy. Once the desired level of relative humidity has been programmed, anywhere between 20% and 80%, the humidistat controls the unit, cycling it on and off to maintain the pre-set level without further intervention by the user. This provides a stable level of RH and saves energy by preventing the unit from operating when not required. A remote humidity sensor/control is supplied with the dehumidifier to enable relative humidity in the pool, or other dehumidification area, to be monitored and controlled if the unit has been installed in a location outside that area. The HI E Dry Vehere Dehumidifier is configured for continuous drainage. Drainage is by means of a gravity feed and a four foot drainage hose is supplied. If a suitable drainage outlet is not immediately adjacent to the location of the unit a separate condensate pump will be required, either to force the water horizontally or vertically to a more remote outlet. The omission of an integral condensate pump must be considered a disadvantage of this dehumidifier and operators requiring this facility may wish to consider the Hi-E Dry 195 as an alternative. The 195 is similar in almost all respects to the Vehere but includes an integral pump with a 17 foot lift capacity. The Vehere is a large unit but not so large as some dehumidifiers of comparable capacity and its exterior dimensions are just 36.6 x 19 x 40. The unit weighs 180lb but is equipped with four robust caster wheels for ease of movement. The unit is durable and its robust components are enclosed in a stainless steel, corrosion-resistant casing for long life. The unit is backed by a five year warrant on the sealed refrigeration system parts of which the first year covers parts and labor.